Dr. Jong is a board-certified internist. She graduated from Wesleyan University with a bachelor of arts degree in East Asian Studies and was awarded her medical degree from the Mount Sinai School of Medicine. She is a Fellow of the American College of Physicians. 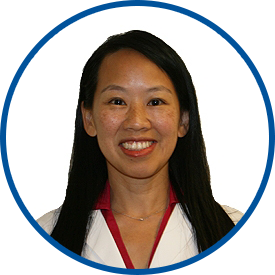 After completing her internship and residency training at the Columbia-Presbyterian campus of the New York Presbyterian Hospital, she was in private practice in the White Plains area for five years until she relocated to Hong Kong. While Dr. Jong was a faculty member of the Department of Medicine at the University of Hong Kong, she developed and facilitated problem-based learning tutorials for medical students and moderated the Family Medicine Unit’s continuing medical education activities for residents and faculty. Dr Jong is fluent in Mandarin Chinese and has a working knowledge of medical Spanish. She joined WESTMED Medical Group in August 2011. New York Presbyterian-Columbia Univ. Medical Ctr. Love my provider, I recommend her to others. Dr. Jung is an excellent doctor who provides patients with a theoral exam, listens to them and cares for her patients. She's professional and courteous. She's amazing! Doctor was very attentive and listened carefully to my concerns. Explantations were clear and she provided material to read. dr. Jong is one of th most informed, caring and diligent doctors I have ever been to. She cares about her patients and proves this whenever I see her. she is the best. Dr. Jong is excellent. When a medication was recalled she contacted me via email to notify of change in medication due to recall. She is always responsive to questions or request for help sent via email. Dr. Jong is an outstanding Doctor in every way!!! see reply earlier. Dr. Jong is a terrific physician. Dr. Jong is wonderful. She is caring, clear and so very nice. I would recommend her (and have) to anyone. I am so grateful to be her patient. never had a bad experience with Dr Jong, that's why I travel from MA. I love having her for my Doctor. Dr. Jong is very helpful, warm caring and professional. Dr. Jong is the most thorough and thoughtful physician I've ever had. A skilled practitioner and a wonderful person, too.